The Climate Leadership Programme (CLP) Cycle 1 was first introduced on October 2010 by The Centre for Climate Risk and Opportunity Management in Southeast Asia and Pacific (CCROM SEAP) at Bogor Agricultural University (IPB) in collaboration with The Deutsche GesellschaftfürInternationaleZusammenarbeit (GIZ) GmbH, on behalf of the Federal Ministry for Economic Cooperation and Development (BMZ). The programme continued by creating other three batches within four years (CLP Cycle 2, Regional CLP, and National CL+), with around 76 alumni from four batches with various background, knowledge, experiences and skills. With those valuable assets and resources, the network should be seen as a very potential group to make contribution to the country. The alumni conference was held with intention to strengthen the alumni network and to provide space for alumni to share experiences and expertise as potential collaboration among alumni. 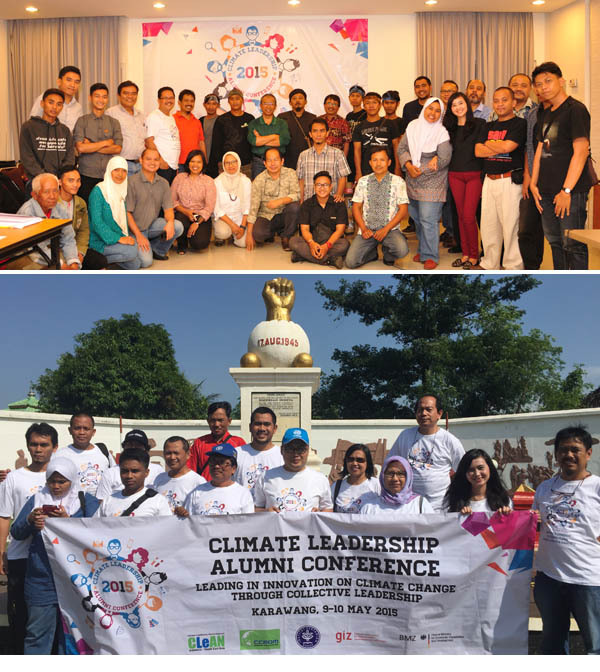 The conference was held for 2 days from 9 – 10 May 2015 in Karawang, with main agenda of sharing experiences, expertise, and dialogue among alumni with Karawang local communities who focusses on climate change activities, as well as field trips on the second day.